When Sophie & Friends first contacted me to do a review on their new product, I was excited. 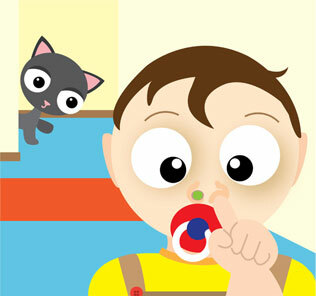 It was a device that helped you get rid of the "gold" in your baby's nose. If your baby is like my baby, he/she will have lots of it. And I used to dig 'em out using my little pinkie (which failed miserably), cotton buds and just about anything I can get my hands on that is small enough to get in. But none of them worked (and some may even cause her immense pain)! I was very happy to try out the "gold-diggin" device also known as Cleebo, which has been developed by Opus Innovation Limited. The packaging caught my eye immediately. And so did Girlee. The different coloured tips are meant to give your child a choice of colour before engaging in the all-important task of "gold-digging". But before I could try out the product, there must be something that required digging doesn't it? So I waited a few days before I finally spotted the "gold". Time to pull out the big-guns! Option 3: Pull tweezers wide apart and use one side only as noted in ‘Option 2’ above. This method is effective for tiny nostrils. Should the tweezer tips remain too far apart, pinch the tweezers immediately above the ‘circle’ between the thumb and the forefinger and squeeze to reduce the gap as required. As I was a novice, thought I would try out the conventional tweezing method as that made the most sense to me. My baby was extremely wary of anything sticking up her nose as expected possibly due to the many nightmares she has had of me prodding all sort of stuff into it. After much struggling, I managed to hold her down long enough to test it. As you can see, she soon realised that there was nothing scary about the Cleebo. The soft tips didn't hurt her and it got the job done in 5 seconds (sans the 1 minute of struggling to get the Cleebo in). Disclosure: A complimentary Cleebo was received from Sophie & Friends for the purposes of this review. No monetary compensation was received; all opinions are my own.